Sig Sauer holds an impeccable reputation in the domain of firearms, but does that level of expertise trickle down to their other products? If you’re in search of an affordable optic to outfit your rifle with, whether it be one you’re planning to take down whitetail deer with or geared for hunting varmints, the Whiskey 3 might just be the solution for you! Gratifyingly simplistic features intermingle well with precision craftsmanship to create a piece of equipment worth every cent you paid for it. There are no bedazzling qualities to this riflescope, but while not groundbreaking by any means, it’s clean sight picture and sturdy exterior makes the Whiskey 3 out to be a fair contender to be your first or next mid-range riflescope. To learn more, continue to read our Sig Sauer Whiskey 3 3-9×40 Riflescope review. How often will I go shooting with this scope? In what conditions will I subject it to? What exactly is my price range? The Whiskey 3 is a 3-9X40 power riflescope created by Sig Sauer. Most everybody in the shooting community has a firm idea on who Sig Sauer is and the products they make, but in recent times, many would think of optics as the last thing they’d be responsible for producing. Sig Sauer also makes an optic that is a step up from this one in the collection of Whiskey scopes named the Whiskey 5. That model is battery operated, equipped with HDX transmittance glass, and can have up to five times the magnification but all for a prettier penny. Out of the box you will receive the scope and scope cover, a small zip-lock baggie containing an owner’s manual, a very small Allen key, a cleaning cloth with the Sig Sauer logo so eloquently plastered in the center, and a multi-panel card book giving you a basic rundown on the SIG Ballistic Turret design (more on that later). To start with, the riflescope is sleek, yet has a bit of noticeable weight near the rear. Measurement knobs for sighting in the scope are located at the top and right side. As mentioned before, the riflescope can be completely adjusted with your fingers. Sturdy rubber lines the end of the eyepiece, making for a smooth and easy time getting a sight picture. A metallic coating on the exterior gives it added protection against any harsh weather conditions you may find yourself stuck in down the road. Finely etched grooves in the magnification adjustment wheel make switching from one magnification to another laughably smooth. A singular tritium strip is embedded on the selector notch, so even in low-light situations, you can still see what you’re doing without the need of a flashlight. The riflescope holds an IPX rating of 7, which means it can withstand even the heaviest of downpours with ease and can even be submerged in three feet (one meter) of water without being compromised. Not only does this mean you can really take it wherever you go without having to worry about it acting up in the rain, you can feel fearless when exposing it to any sort of water. What you will notice right off the bat is that this scope does not play around when it comes to making you see your surroundings for what they really are. Objects hold sharper edges, colors are more vivid in appearance, and the perception of distance is on par with a lot of higher end rifle optics. This is all thanks to the low dispersion (LD) glass used as the lenses. What this certain type of glass does is shrinks the distance between color layers when they hit the sensor in the lenses. In return for higher quality glass, colors seem richer and full, things contrast from one another for a sharper image and a greater distinction between objects. 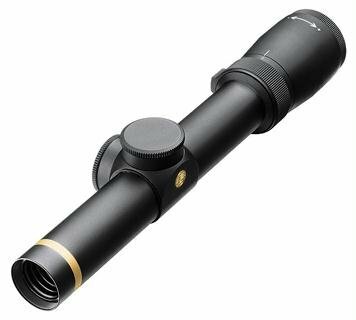 You can also expect to avoid any sort of foggy glass issues with this scope that is a major problem for others at this price range. The reticle is extremely easy to navigate as it’s a European-style eyepiece. This feature is supposed to assist you with a fast and easy time sighting in your rifle. Nothing too complicated to follow, the reticle itself consist of two bolded horizontal and vertical lines which thin out near the area of intersect. Not only will this aid you tremendously with finding your zero relatively fast, but it clears away most of the unnecessary measurements and readings, giving you maximum effectiveness and accuracy when firing on your target. The maximum caliber this scope is advertised to handle is the .300 Winchester Magnum. Place it on any rifle running larger rounds than that and you run the risk of damaging it or even ruining it beyond repair. Anything below the already listed caliber will see prominent accuracy and stellar performance. There is also no caliber it favors over others, but its weight should be taken into consideration when finding the rifle you think it belongs on. This feature is absolutely something! Equipt on most Whiskey and Tango model scopes, this is a laser etched elevation dial that allows you to hold indescribable accuracy at any such range. Taking in many different environmental factors including bullet specifications, muzzle velocity, and elevation, the SBT system calculates for the perfect bullet drop compensation. Whether you can barely see your target or can draw an outline of it while looking out of your scope, this system promises to deliver just the right amount of compensation to make sure every shot lands where it’s supposed to without taking any extra steps. After searching for reviews of this particular optic, most people are truly satisfied with the performance they receive out of the scope. Unfortunately, there aren’t a lot of places to obtain research as the Whiskey 5 receives more attention. There is still a fine amount of content, rich enough to formulate an educated opinion on whether this product is for you or not. The Nikon Prostaff can be a cheaper or a tad more expensive depending on where you want to purchase it. While the magnification is the same, there are few features the Nikon boasts over the Whiskey 3. Their multi-coated lenses make use of up to 98 percent of available lighting, giving you a sight picture that’ll make it a lot easier to see what you’re shooting at. An aluminum exterior helps cut back on the weight for the scope but still offers solid protection to the elements. A few features shared by both are that the Nikon is completely waterproof and fog proof. The adjustment knobs are spring loaded and also able to be twisted by hand. It, however, does not have a European-style eyepiece, rather resorting to a BDC reticle which still advertises for quick target focus. For the money, this scope is near impossible to beat and is the reason why we’ve listed the Bushnell as an alternative. 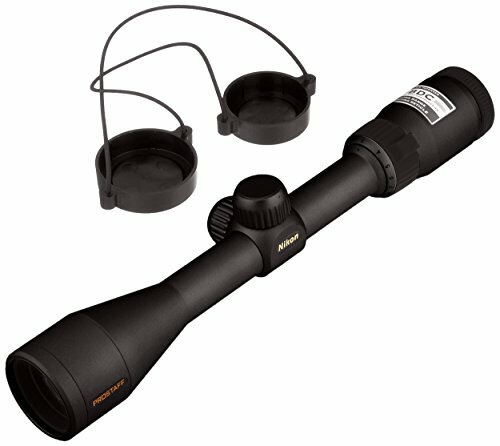 This is more for those that are looking to spend less than $100 on a scope but still be satisfied with the product. The magnification is the same as the other two, and most of the features will be identical compared to the Whiskey 3 and Nikon Prostaff. But, this optic is excellent in low light situations and can be easily adjusted to find a zero. It has no problem with being put on bigger caliber rifles as well as something as small as a .22lr. Not a lot of diversity with this one and the other two, but its price point is noticeably lower than either of the two previously listed. This is where we start scaling up in price, not by a real noticeable amount, but you’ll notice the slight incline. Firstly, the Leupold optic uses lead-free glass along with 4 lens coatings to make for the optimal sight picture in the field. This and the Whiskey 3 share finger adjustable knobs, but this optic has a lockable eyepiece to be sure you don’t lose focus of your target. The interior is purged of oxygen, making for an extremely water and fog proof performance. It has an outstanding zero once set, a durable shell fit for nearly any kind of environment you’d find yourself in, and is completely made in America. In conclusion, the Whiskey 3 is not a run of the mill 3-9×40 power optic, but one that can offer a much higher standard in quality compared to many others on the market. The magnification combined with vibrant colors make it easy on the eyes. Quick adjustable knobs make it a breeze for zeroing and it’ll hold up to the elements substantially well if cared for correctly. If you’re in the market for an affordable scope that needs to be your workhorse, the let the Whiskey 3 be the answer. Thank you for visiting Reloadingpresso.com. If you like any of the equipment that you see in this article, please click on one of the Buy Now buttons to make your purchase on Amazon. As an Amazon affiliate, we make a small commission off any purchase made from a click through from our website, which is how we are able to provide you with these informative articles. You will not pay more on Amazon by clicking through our website because the price is the same as if you go to Amazon directly. 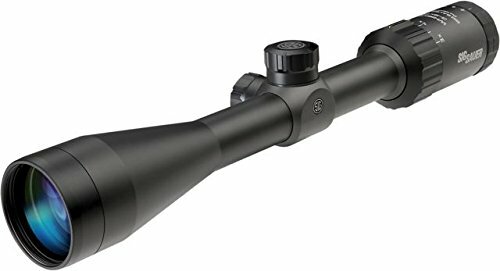 We know you are looking for a scope, if this isn’t the one for you check out our scope buyer’s guides. If you are looking for something else consider our Best Reloading Kit Buyers Guide and our Best Gun Safe Buyers Guide.